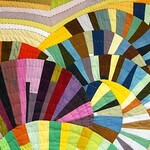 Upcoming Modern Improv Quilting Workshops ~ OCMQG & QUILTCON! 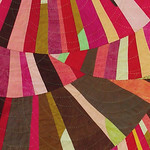 Get your curvy-quilty-modern groove on in this improv quilt making workshop. Participants will discover new approaches to improvised quilt making and composition; develop a personal language of color; and learn basic and advanced improv strip and curve piecing techniques. All skill levels. Based on the Mod Mood Quilt-along. 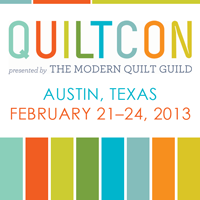 I've also been invited to teach three workshops at QUILTCON, the Modern Quilt Guild's Inaugural National Conference in Austin, TX, February 21st – 24th, 2013. What a surprise to be asked - and what an honor! Are you interested in exploring and incorporating modern improv quilting approaches and techniques in your creative practice? There is something here for beginners and experienced alike! Take a look at what I'm offering below and check out the conference highlights. Registration opens August 30, 2012. Woohoo! This will be my first visit to Austin. I hope I'll meet some of you there! 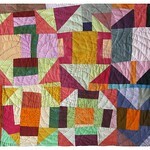 Get your curvy-quilty-modern groove on in this improvisational quilt-making workshop. Participants will explore modern approaches to improvised quilt making and composition, while learning innovative strip and curve piecing techniques. All skill levels. Intermediate and advanced sewers will make more progress. Start with a favorite traditional block pattern and transform it through a series of improvised repetitions into something uniquely modern. We will brainstorm the possible range of alterations and then practice putting our blocks through a series of rhythmic iterations using basic improv piecing and compositional techniques. All skill levels. An improvisational twist on the Round Robin. 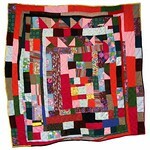 Free your creative energy, use up your scraps, and learn the basic skills of improvisational quilt making. At the end of the day you and everyone else will leave with a distinctive quilt top beyond anyone’s wildest imagination. There are no mistakes in this fast-paced class, only discoveries, community, and FUN! Perfect for fist time improvisers. Sign up with your friends! All skill levels. If you would like me to teach in your neck of the woods please contact me or pass my workshop information to your guild organizers.